Four years ago, playing online poker was a gray-area activity, without legislation. Then, just as Congress was about to close out its 2006 lame-duck session the SAFE Port Act, designed to protect American ports from terrorists, gained approval -- with the Unlawful Internet Gambling Enforcement Act (or UIGEA) grafted onto it. The UIGEA forbade transferring funds from financial institutions to Internet gambling sites, using the dubious rationale that terrorists could exploit those sites to launder money. The law's passage caused one online poker entity to cease doing business with American players, making it arduous for new players to deposit money into sites that still wanted them. It also cast a pall over the enterprise of online poker -- though you'd never know it from the commercials and leased-time TV shows that, on any given night of the week, hype websites like PokerStars and FullTilt. Considering the UIEGA's genesis, it's fitting that the salvation of online poker may come on the back of another piece of congressional legislation: the recently announced tax-cut package, being presented at this month's lame-duck session. Nevada Senator Harry Reed (D) is attempting to introduce legislation that calls for online poker's regulation and taxation. "We always anticipated that there would be an opportunity to push a proposal through at the lame duck," says John Pappas, executive director of The Poker Players Alliance, a Washington, D.C.-based lobbying organization. "With the government needing money, we think there is a real opportunity here. The effort will be to get the bill through and signed into law." But that may be easier said than done. Republican opponents of the bill are rallying hard against it. Senator Jon Kyl of Arizona told Politico that there is "zero chance -- no chance whatsoever that would be part of the tax deal." At least one congressional aide has taken to calling Harry Reid "Harrah" Reid, playing off the name of a casino that stands to gain greatly if Reid's proposal gets made into law. Harrah's, after all, owns the World Series of Poker franchise -- and management is champing at the bit to introduce an American online poker site connected with the most famous poker tournament in the world. A leaked draft of Reid's proposal reveals a plan to have licensees pay a 20% tax on all deposits, and it calls for a 15-month online poker hiatus -- during which ongoing poker sites in the U.S. will temporarily stop operating here (in order to create a level playing field between new sites and existing ones). It would also have an initial two-year period during which gaming-machine manufacturers, as well as casino and race-track operators, would be the only entities licensed. Unbothered by the moral qualms that Kyl and other online poker opponents like to raise, Pappas of the Poker Players Alliance envisions a bullish market if Reid's bill manages to pass. 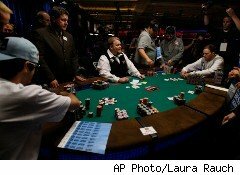 "We think online poker could go to twice the size that it is today," he enthuses. "Right now there are 10 million Americans with accounts, and we can see it going up to 20 million." With all those poker neophytes expected online, veteran players must be viewing Reid as their unlikely ace in the hole.